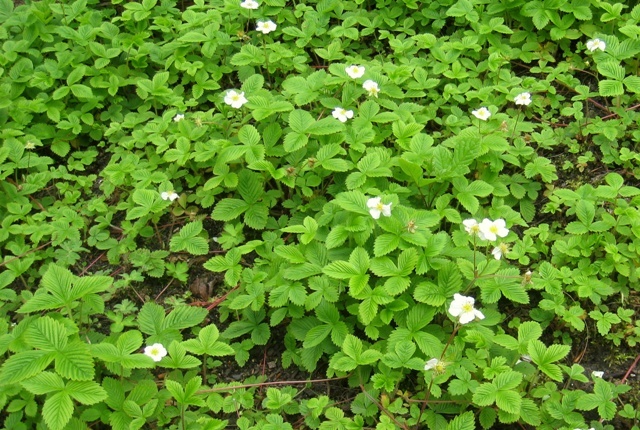 « BHUIN AAKHE_Fragaria indica » STRAWBERRY_Fragaria spp. 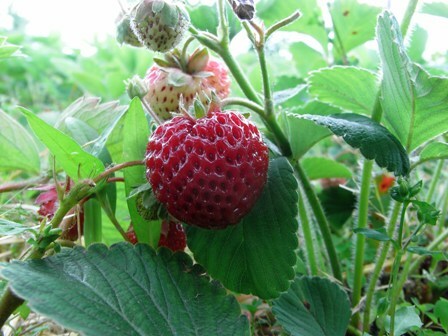 Magroos is a wild strawberry which native to higher Himalayas. 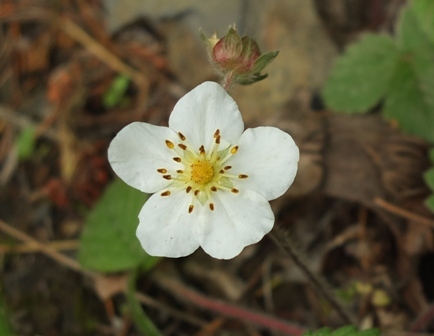 It grows in wooded valleys, forest margins and meadows on mountain slopes, at altitudes between 1500to 3600 m in Afghanistan, Pakistan, India, Nepal, Bhutan, Western China, Myanmar etc. It is a cold area plant. Though magroos fruits are edible and even are also collected and sold by children, yet it does not have much commercial value. So there does not seem to be any scope for its domestication. Plants stoloniferous, 4–25 cm tall. Leaves 3-foliolate, lateral leaflets often distinctly petiolulate, elliptic or obovate, abaxially appressed white sericeous (sometimes sparsely so between veins) appearing silvery, adaxially appressed pilose, base broadly cuneate or rounded, margin sharply incised serrate, apex obtuse. Stems and petioles appressed to spreading. Inflorescence 1- to several flowered. Pedicels appressed white sericeous. Flowers large, sometimes more than 2.5cm diam. Epicalyx segments lanceolate, abaxially sparsely villous, margin entire to dentate, apex acuminate. Sepals ovate-lanceolate or ovate-oblong, apex acuminate. Petals white, obovate-elliptic. Stamens numerous. Carpels numerous. Glandetum ovoid, fleshy, red, with persistent sepals appressed. Achenes ovoid, smooth to rugose. Magroos fruits are edible and taste good. At certain places local children gather fruits and also sell them. Magroos is reported to have useful medicinal properties and is therefore used in few ailments. The plant is reported to be emeric. Its leaves are used for boils and ulcers inside the mouth. Juice of leaves is dropped in ears for relieving earache. Root paste is diuretic, laxative, diaphoretic and astringent. Fruits are used in the treatment of liver disorders and anaemia. Fruit juice is given to children for hastening recovery from weakness after illness or high fevers. Magroos is not cultivated. But still it can be multiplied by seed or from stolons.